"There is nothing better than when the plan comes together." Nicky Wire is in a happy place at the moment. Just when you thought that the rug was finally going to be pulled out from under them, along comes Send Away the Tigers, the Manic Street Preachers' eighth studio album and the one to bring back a raised level of everything that's important to a band of their vintage: profile, credibility, chart hits, kudos and fans. Alone and very much of themselves, the Manics are the type of rock act that depends and thrives on the loyalty factor; while the band initially went into free fall following the disappearance of their founding guitarist Richey Edwards, there was, nonetheless, such a fervent fan base eyeballing their every move that they have lived under the threat of disconnection from the same people who thrust them into the limelight. It would be fair to say that lives have been altered if not saved by Manic Street Preachers ("We're tired of giving a reason why we're the only thing left to believe in," wrote Wire in their 2000 UK chart-topper Masses Against the Classes), and if fans had assumed their lifeline band had lost focus, then trouble in some shape or form would emerge. Losing focus is something that the band had accused itself of in the years leading up to the writing of Send Away the Tigers. 2004's Lifeblood was something that even the fans had surely chosen not to consider: just another Manics record. An interim period ensued where both Wire and James Dean Bradfield released solo albums of varying worth. Wounds were licked. Tails were tucked neatly between legs. Simply put, the follow-up to Lifeblood had to be brilliant. "Without a doubt," says Wire, a loquacious Welshman with few friends outside the immediate band and family circle, a loner by choice if not design. "I really wanted to reconnect with ourselves, first and foremost - I wanted us to fall in love with each other again, the three of us in the studio. So we went into a crappy little studio in Cardiff - with no record company, no manager, no producer - and if the songs didn't give us goose bumps we ditched them straight away. We wanted to feel from the outset that we loved the songs, and if the passion was there between us then that would translate to the fans. We looked at Everything Must Go and Generation Terrorists and we felt we wanted to try and cherry-pick the best parts of those two records - the punky, naive idealism of the latter and the classic uplifting nature of the former. That was the template." And that perception of the band as an entity that could change people's lives for the better - did that change over the years? Wire states that the reason the band set out to be a crucial part of their fans' lives was because all their favourite bands moved and changed them, gave them something to latch onto beyond the usual riffs - hearing, for example, Allen Ginsberg for the first time via The Clash, or listening to Morrissey talk about Oscar Wilde. "To do that on a regular basis - to move and change people - you have to be refreshing your audience all the time, picking up new fans. And maybe for around five years we didn't do that, and you can wither on the vine a little bit." The best thing about the latest record, remarks Wire, is that it has sparked up interest in the band again - Forever Delayed, 2002's greatest hits package, has sold almost 15,000 over the past few months. "There's a new audience coming along, which is good. It's what happened in 1996 when we released A Design for Life (the band's first UK top-three single). It's kind of vampiric - you need new blood." It matters to Wire and the other members of the band that, with the commercial success of Send Away the Tigers, they have strengthened and extended their lifespan for at least another few years. They could easily have turned into a live act that releases the occasional record and tours Britain and Europe simply to make a living. Ambitions diminish, hopes fade, and the only people they connect with are the fans still hanging around in order to hear the hits. "We still have an ambition to connect with people, but sales aren't all that matters, although it's gratifying to us that the record is doing well - and it's also, I reckon, a vindication for our fans and for us. Very few of our contemporaries have lasted. Radiohead are still around, but you don't really know if they're still functioning as a band. Blur? It's the same kind of thing - Damon Albarn is still making brilliant music, but not as Blur. For us to get this far, it does still feel we're vindicated, that we still want it as much as we do." Has the band mellowed with passing years? It's all about control, admits Wire. "I think we've learned to channel our nihilistic tendencies into something slightly more positive. It's always been there - it's the reason why we formed a band, why we lived in each other's bedrooms, and talk incessantly and plan. That's never going to go away, but we've just learned to channel it. To be honest, I don't think we've mellowed at all. The rawness of us as people together is still there, but we try and translate that in a slightly more constructive way." A lot of people see 1994's The Holy Bible as the ultimate Manics album, its themes of nervous breakdown, self-loathing, turmoil, illness and confrontation as performed by slim men in military/terrorist apparel, totally out of step with Britpop but perfectly in tune with rock music's inherent dysfunction. Five months following its release, Richey Edwards, the writer of most of the songs, disappeared. It is, says Wire, a record he loves, but not one he particularly enjoys. "It seems separate from a lot of other Manics albums," he ponders. "It's very internal and very much about a state of mind. We could never do another album like that because it's someone else's state of mind, and the areas that Richey went into are not something I'd want to. I admire him and the record, but if people are holding out for another one of those they'll have a long wait." 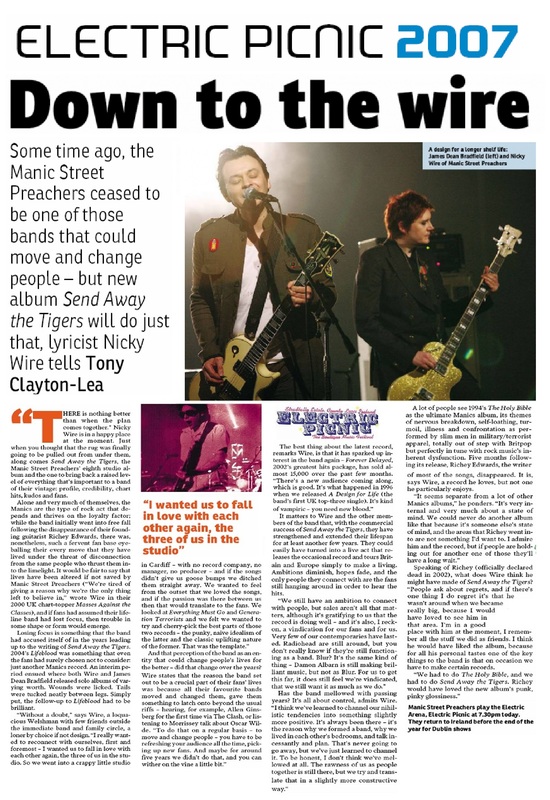 Speaking of Richey (officially declared dead in 2002), what does Wire think he might have made of Send Away the Tigers? "People ask about regrets, and if there's one thing I do regret it's that he wasn't around when we became really big, because I would have loved to see him in that area. I'm in a good place with him at the moment, I remember all the stuff we did as friends. I think he would have liked the album, because for all his personal tastes one of the key things to the band is that on occasion we have to make certain records. "We had to do The Holy Bible, and we had to do Send Away the Tigers. Richey would have loved the new album's punk, pinky glossiness." This page was last modified on 12 August 2018, at 17:35.